We have two levels of membership in GeocacheAlaska! : Cheechako and Sourdough. Cheechako memberships are free and get you on our mailing list for the Newsletter and special club announcements. We encourage anyone interested in geocaching in Alaska to at least join as a Cheechako member. Our membership roster is used when negotiating geocaching permits with land managers. It is very helpful to demonstrate the size of our user group, especially when working on access to multi-user lands and trails. Sourdough memberships cost just $20 per year. GeocacheAlaska! Inc. is a non-profit organization under 501(c)(3) rules, so your membership fee qualifies as a tax deductible donation. Funds support the operation of the organization. Sourdough members enjoy voting rights and receive discounts on merchandise and event fees. Sourdough members are also eligible to remotely attend certain EduVent presentations via remote access if they are not able to attend in person. 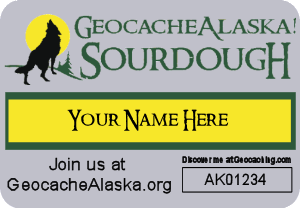 All Sourdough members will be issued an official GeocacheAlaska! trackable Sourdough Nametag. It will be customized on the front with your official Geocaching.com username and features a magnetic catch on the back so you can display it during events. These nametags are pre-registered under the GeocacheAlaska! profile and virtually dropped into our first event listing in Anchorage. When received, the member should "grab" the tag to move to their own inventory. After the Sourdough nametag is created and registered, it will be Adopted out to the Sourdough member's official geocaching.com account. It is up to the member to accept this adoption to transfer ownership of the tracking number. While signed into your geocaching.com account, simply go to geocaching.com/adopt to accept and complete the adoption process. There are several ways to join as a Sourdough member. You can attend a GeocacheAlaska!-sponsored event and give your application and payment to a Board member, or visit the Event Store and pay the store manager. You may download a printable membership form, fill it out, and mail it to Anchorage address listed on the form along with your personal check. And you may pay online via PayPal by using either the shopping buttons below. You may pay for an annual membership, or you may setup a Subscription payment through PayPal that will automatically renew every year. If you join as an annual member, we will e-mail you with a renewal notice near the end of your one-year membership term. If you have any questions about membership, your membership status, or membership payments, please contact our Treasurer. Sign up for a Subscription to Sourdough Membership. PayPal will automatically renew your membership every year on your sign up date. Please enter your official geocaching.com user name in the text box and then hit the Subscribe button. You will be taken to the PayPal site to provide secure payment. Please enter and verify that your Mailing Address on your PayPal account is current before completing the transaction. You may Unsubscribe from your subscription at any time. If you Unsubscribe, any time remaining on your current year's payment will continue. You will recieve an e-mail notice at the end of your subscription term as a reminder to renew as an annual member. To Unsubscribe, hit the button to the right. Alternatively, you may log into your PayPal account and navigate to the Manage Subscriptions page of your account. To purchase a One-Year Sourdough Membership, enter your geocaching.com user name in the text field and hit the Add to Cart button. You will then be taken to PayPal to view your cart contents. Use the Checkout button to complete your secure payment through PayPal. Please verify that your Mailing Address is current on your PayPal account before completing the purchase. To sign up for a free Cheechako Membership, please download and fill out the printable Membership Form. Bring it to a GeocacheAlaska!-hosted event, mail it to the address on the form, scan it or take a photo of the completed form and e-mail it to the Treasurer for processing. GeocacheAlaska! Inc. is not affiliated with Geocaching Headquarters (Groundspeak) and membership does not give the member access to geocaching.com nor any Premium Membership features of geocaching.com. We do require all Sourdough members of GeocacheAlaska! to separately have and maintain an account with geocaching.com in order to issue a trackable Sourdough nametag. Sourdough members must provide their geocaching.com username as part of the sign-up process. If we are unable to locate a valid username in the "find friends" feature at geocaching.com, we will not be able to issue you a Sourdough nametag trackable.